Salima Nasir Khan undertook her work placement as an adviser at LSBU’s Legal Advice Clinic (LAC) once a week for four months. The LAC is a free drop-in service that offers the public free legal advice. Drop-in sessions allow the clinic to see as many people as possible; see the LAC website for term-time clinic opening hours. Solicitors from local firms volunteer to provide specialist advice in family or housing, while the students provide clients with basic information on any topic, generalist advice in any social welfare law matter and specialist legal advice in family and housing. During each session, there are two supervisors present as well as four student advisers and one receptionist. One supervisor and two student advisors interview each client, and the role of the supervisor is to guide the student advisers and step in if necessary. “During each session, another student and I would be assigned to a supervisor where we would work together and help the clients,” says Salima. “As an adviser, my role included interviewing clients and taking notes of what the client was saying, and I also had to make sure I asked relevant questions and for any related evidence, such as letters or paperwork. After interviewing the client, we would go to the research room and try to find information and advice to give to the client, using websites such as Citizens Advice Bureau, AdvisorNet and the government website." "For each client, we would print out the appropriate information and give this to them, and would also keep a copy for our records. If our client provided us with any evidence, we would also make a copy of these for our records. We would then go back and provide generalist advice to the client. If we could not provide advice, we would signpost the client to a list of specialist solicitors’ firms or refer them to one of our Thursday evening sessions. After seeing the client, I would write up a client record sheet where I would include details of why the client came to the clinic, what was advised to them and if they were signposted or referred elsewhere." Prior to starting her placement, Salima was required to attend a two-day training session where she was given information on how the clinic works and what her role would entail. During these two days, she participated in role-play activities to help understand her role in the clinic and the range of different clients with different problems she would face. “One of the problems during interviews could be if the client talks and goes off topic, and so we were taught to be able to bring the client back to the reason why they are there by interrupting politely and asking them a question regarding the situation,” she explains. “The training also covered general matters such as working with clients, interview skills, using information resources, the clinic policies and procedures, and how to refer and signpost to other clinics or firms. On the last day of training we visited the clinic and were shown the layout of each interview room and the research room, which allowed me to have an idea of how it would be like to work there. Working at the clinic presented Salima with different cases every time, including employment and housing matters. Examples of employment cases include clients being made redundant or being discriminated against at work, while housing cases included issues with landlords, payment of rent or clients being homeless. “When a client came to us for advice for being discriminated against at work we had to make sure we found the right advice to give. An example of this advice was that we needed to make sure our client had a trade union representative who would be able to assist them during this time, and we also advised our client to make an application to Advisory, Conciliation and Arbitration Service for a certificate that would then allow them to make a claim to the employment tribunal. We made sure to inform the client how much time they had to make a claim. “After we saw each client, my supervisor would give me feedback on how well I interviewed the client, the advice I gave and the way I wrote up the notes on the client record sheet. I received a lot of support from my supervisor, such as brainstorming questions to ask prior to interviews and help with structuring the way I gave advice to the client, so it would be easy for them to understand. 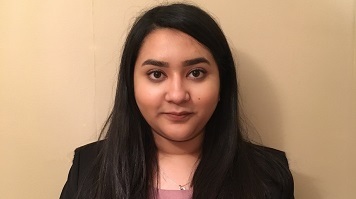 “Working at the clinic really allowed me to gain experience in the legal field and helped me be sure that I want to pursue a career as a solicitor. This is because when I was observing the solicitors who came on Thursday evenings I could see the way they communicated with the client and how much they helped and how it made the client feel."